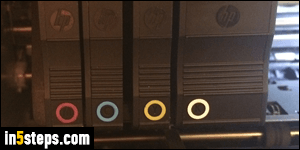 Running out of ink always happens at the worst time, so hopefully you have replacement cartridges for your HP Officejet Pro 8600! Modern ("smart") printers will refuse to print even if you do -really- have enough ink left to print a document, albeit with very faded text. 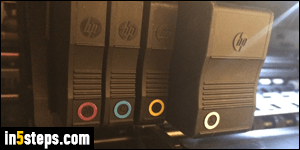 Note that the steps I show in this tutorial might also apply to other 8000 series printers by HP, not just the 8600. First, you can optionally cancel any pending print job from your queue. 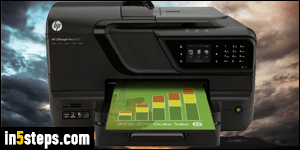 Then, go to your printer and make sure that it is turned on: this is essential, because the motor will automatically move the ink cartridges into position to the left, so that you can replace them easily, and without damaging your printer. Once the printer is on, pull open the side door on the left, as shown on the picture. Don't touch anything until your printer has fully moved the ink cartridge tray all the way to the left, and no longer makes any noise. Then, gently push on the cartridge you want to replace, and a back-loaded spring will push it outward. Grab and remove the cartridge, insert a new, corresponding cartridge back in. Make sure that the ink color matches exactly, or you won't be able to print! 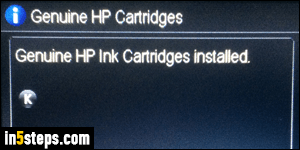 Close back the lid, and your printer's LCD display should show a "Genuine HP Ink Cartridges installed" confirmation message. It will also show icons indicating which new ink colors were detected (see the last, bonus step for an explanation of what each of these letters mean). 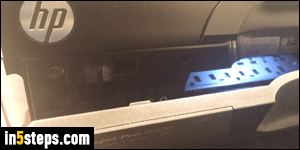 If you don't get another error or warning, you are done, and can resume using your printer. That was a quick fix! In my case, I was printing an Amazon shipping label, and initially only changed the black ink cartridge (K). 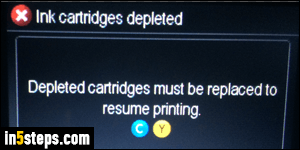 But upon closing the printer, I got the following message: "Ink cartridges depleted must be replaced to resume printing" - and ended up replacing all color inks as well (C, M, and Y). Put in the new cartridges as instructed, and close the printer's "door". If you didn't cancel them, any documents queued will (or should) automatically resume printing! Bonus Tips: colors on a desktop PC's monitor, a laptop display, and tablets / smartphones use the "RGB color model", where Red, Green, and Blue light is mixed to create a millions of color combinations. In the print world, colors are created with the "CMYK color model", where ink colors are mixed to create any color. C stands for Cyan, M for Magenta, Y for Yellow, and K for Black.